I have started to notice that I use the phrase WIC quite a bit on this blog as a shortcut, and I’ve never discussed it at length. Time to discuss. What do I mean when I say WIC? In short: I mean the Wedding Industrial Complex. In long form, it’s a lot more complicated. I wish I could tell you the genesis of the term Wedding Industrial Complex, but I can’t. I wish I could tell you the first time I heard the term WIC, but I can’t, at least not precisely. I do know it was in the 1990’s, a time when we spent a whole lot more time talking about the Military Industrial Complex, and I also know that I thought it was hilarious. It was funny in the way a New Yorker cartoon is funny. It was true and ridiculous at the same time. It was layered. It was evocative. The first time I heard the term I imaged factories churning out wedding dresses and massive diamond rings the same way they might churn out missiles or M-16’s. I thought that it was correct in that the wedding industry can be destructive and enormous, but it was silly because the Military Industrial Complex was about making war and the Wedding Industrial Complex was (at least overtly) about making love. It was complicated, and I like complicated. It made me snicker, and I like snickering. It made me think, which as you might guess, I like. All of this is a long way of saying, I use the term WIC because it makes me laugh. I use the term WIC with my tongue rather firmly in cheek, and I think at some point we lost track of the fact that the term is satirical. So, you’re wondering, *who* do I mean when I say WIC? Well, I mean two groups of people. The first thing is the most obvious: The Wedding Industry, all caps. The people that make money when we get married and are employed to figure out ways to maximize that profit: wedding magazines, bridal fashion conglomerates, the diamond industry, etc, etc, etc. To be perfectly clear: I am not anti-consumer, and I am not anti-profit. I don’t think that there is an inherent problem with business or making money. That said, I think that the ways in which The Wedding Industry tries to sell us products are manipulative. I dislike the way that the wedding industry has changed our societal perceptions of a ritual that is designed to unite two people in a sacred or secular rite, into something resembling a massive theatrical production. Which brings me to the second thing that I mean when I use the short-hand of WIC: I’m talking about Societal Expectations Of A Wedding. I’m talking about how when you tell people, “Oh, yeah, I’m just letting my bridesmaids wear what they want,” mouths drop open. I’m talking about how when people ask to look at your engagement ring, if it doesn’t meet their expectations they will voice their disapproval to your face. I’m talking about how, within a generation, we moved from parents throwing wedding receptions at home to parents throwing receptions in castles. But finally, finally, I think blaming the wedding industry is way too easy. 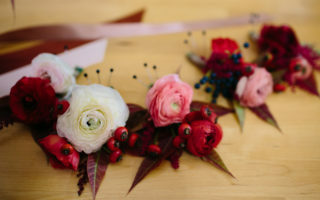 I use the term WIC because I need to keep posts short, and because I think every couple getting married in any even slightly non-traditional way knows what I mean on a gut level when I say “Wedding Industry.” But I think the reason that the Wedding Industry is successful is because it taps in to things that many of us like: expensive shoes, fancy jewelry, pretty dresses, fantastic stationary, feeling like the star of the show for a day, or—say—castles. It’s easy to mock, but in the end for many of us, there is a part of us that wants these things (at least a little bit). If I was totally un-enamored of all things wedding, I’d be a boring wedding writer. If we had just run off to the courthouse when David proposed, I never would have needed to write this blog. But in the minutes after the proposal when I was sitting on a bench in a daze, David asked me, “Are you ready to plan a wedding?” and I whispered, “Yesssssss.” I just didn’t know how hard it was going to be to plan it on our own terms. And that, my friends, is why I talk about the WIC. Tongue firmly in cheek. Thoughts on your relationship with the wedding industry are welcomed (even relished) in the comments. But a for-warning: I expect all of us to keep it civil and smart, even when talking about a part of wedding planning that sometimes makes us want to gouge out our own eyes, or the eyes of others.